In the 1840's the vast virgin forests of Michigan were coveted by lumbermen for building the new towns and cities of the Great Lakes region. 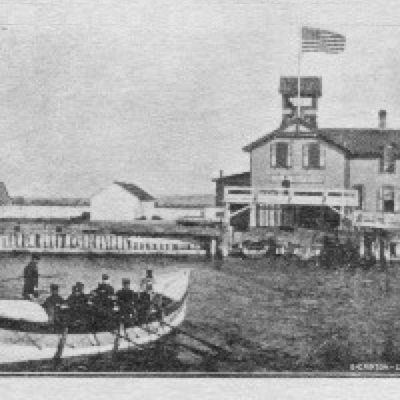 John and Joseph Stronach sailed the eastern shore of Lake Michigan in the fall of 1840 looking for a opportune place to site a lumber mill along one of the many rivers flowing into the lake. They came across the mouth of the Manistee River and were greeted by friendly Chippewas. Finding the site advantageous, John returned with his son Adam, 15 employees and mill machinery in April 1841 to establish the first non-native settlement in what was to become Manistee County. By the late 1800's logging had been joined by shingle production and salt mining as very lucrative businesses for the region. During its boom years Manistee boasted the largest per capita concentration of millionaires in the US. Local businessmen attempted to improve the harbor by building short piers at the river mouth to prevent sandbars blocking shipping access to the mills up the river, but federal planning and funding was required for adequate protection. In the early 1860's the Army Corp of Engineers surveyed the river and prepared plans for channel improvements and the establishment of a lighthouse to guide ships into the harbor. 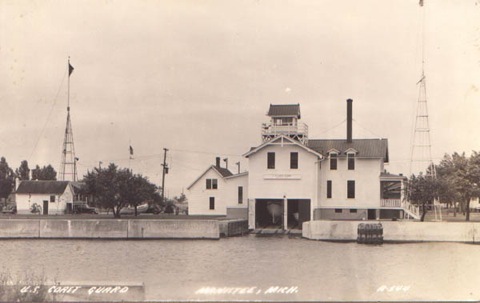 Work began in 1869 on the first lighthouse on the north shore near the mouth of the Manistee River, and first light was exhibited on the opening day of the 1870 shipping season. The original lighthouse consisted of a two-storey wood-framed dwelling with an octagonal lantern housing a 5th order lens on the lakeward end of the roof gable. On October 8, 1871 a forest fire swept through area burning the town of Manistee to the ground, and taking the new lighthouse with it. The keeper, John McKee, constructed a temporary light on a pole near the lake to guide ships until a more permanent structure could be built. 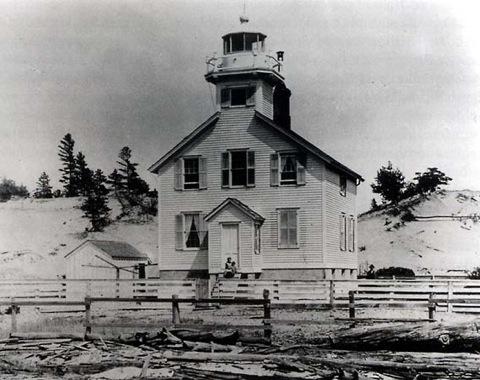 Congress appropriated $10,000 for the reconstruction of the lighthouse in the Spring of 1872 and first light was exhibited by September utilizing a temporary lens scratched up by the district engineer. The 'second' Manistee Main Light was an exact reconstruction of the short-lived 'first' light. By late 1873 the temporary lens was replaced by a new permanent lens shipped from the manufacturer in Paris. To accommodate increased shipping traffic the piers were extended 150 feet and the channel was dredged deeper in 1875. 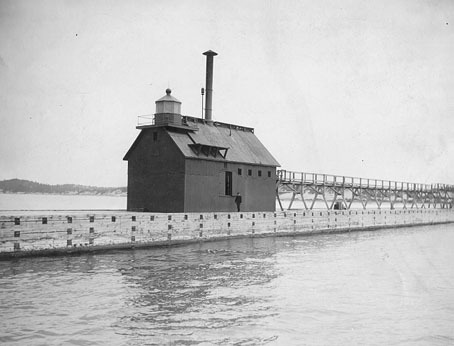 The channel modifications placed the main light too far back for ships to safely navigate the end of the piers and the light was extinguished only three years after it had been rebuilt. A pierhead beacon was constructed on the south pier requiring the keeper to row across the channel from his dwelling in the old main light several times during the day and night to service the light. Ever increasing ship traffic necessitated the reactivation of the main light as a coastal light in 1894 along with relocation of the pierhead light to the end of the extended north pier. 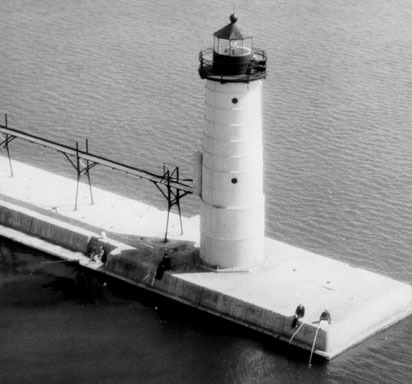 Over the next few years additional work extended the piers further into the lake requiring subsequent replacements of the pier light with a light on a pole, a movable light on a steel trolley, and a lantern with gallery placed on the lakeward end of a fog signal building. Electrification came to the lights in 1925, the fog signal building was eventually torn down and the current 39' cast-iron light tower was built at the end of the north pier in 1927. With the activation of the new light tower, the old main light was once again deactivated and the lantern was removed from the dwelling in 1927. In 1993 the keepers dwelling, which had served off and on as the main light for so many years, was sold and moved away from the waterfront. It is now indistinguishable as the old lighthouse. In the mid-1850's the Federal government recognized the need to provide life saving equipment along the nation's busy waterways. A surfboat was sent to Manistee, but no funds were allocated to house and maintain it or provide for a full-time crew. All life-saving was performed by volunteers from the community. Charles Gnewuch, a local tugboat captain, was awarded a gold medal by the federal government for saving 24 persons from drowning between November 1874 and October 1880. 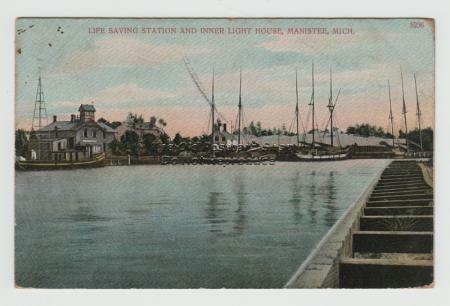 By the mid-1870's shipping traffic had increased to the point that the port at Manistee was second only to Chicago's Calumet Harbor in total tonnage shipped on Lake Michigan. With industry lobbying, Congress finally appropriated funds for a professional life-saving service to meet the needs of the country's mariners. 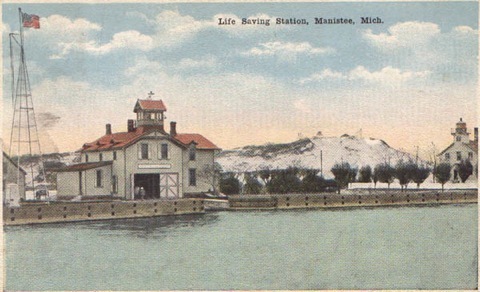 In 1879 the US Life-Saving Service established station #5 of the 11th District on the north side of the channel mouth at Manistee. Funds were provided to build a two-storey boathouse with lookout tower and living quarters for a full-time crew of 8 men during the shipping season. The treacherous waters off Manistee and sheer volume of shipping provided many opportunities for the station crew to save ships and lives. On November 5, 1892 the schooner Guido was overtaken by heavy weather, but the station crew saved the ship and her grateful captain sent a letter to headquarters to thank them. But not all rescues were successful that year and the sad task of recovering the dead sometimes fell to the crew. 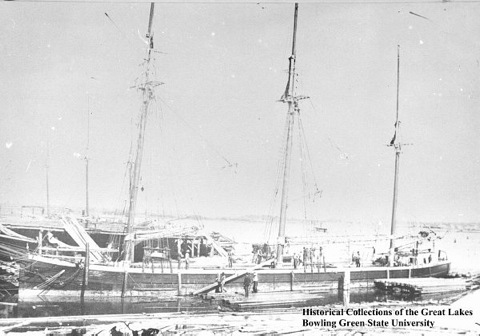 On August 30th the schooner City of Toledo left Manistee with a load of lumber, was caught in a northwesterly gale, and capsized about 14 miles away with the loss of all nine aboard. The station crew patrolled the beaches for bodies and later helped right the ship after she was towed into the harbor. Her Manistee-based captain, John McMillan, had his daughter Lizzie aboard as a cook and hers was the only body recovered from a beach seven miles from home. Often the life-saving crews were only able to help mariners after they had spent hours frantically pumping and fighting back the freezing waters while trying desperately to make port, but that is when the exhausted sailors needed them most. In the first week of October in 1887 the schooner Jessie Scarth was taking a load of corn from Chicago to her home port in Toronto when a huge wave broke on her deck and almost swept away her lifeboat. The next day the boat was once again washed overboard, damaged and her oars were swept away. The Jessie Scarth started to take on water and the crew pumped valiantly all day, but when the crew stood knee deep in water the order was given to abandon ship. Captain John Roberts, a female cook and the crew of four embarked in the damaged lifeboat. A ladder was broken apart and the uprights were used in place of the lost oars. Two of the crew stood in the boat and held their coats open in the gale to act as sails. They made it 12 miles and were almost dashed upon the outer piers before the life-saving crew were able to fire a line and haul them safely into the harbor. 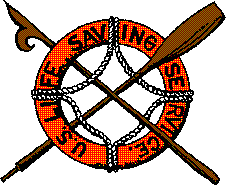 In 1915 President Woodrow Wilson merged the U.S. Life-Saving Service with the Revenue Cutter Service to form the modern United States Coast Guard. 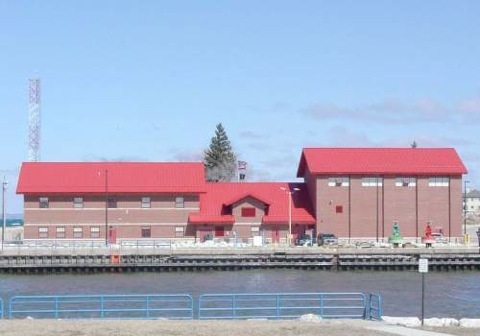 Coast Guard Station Manistee has seen many changes in the following century, and after rebuilding in 2005 has become the parent unit to the adjacent small stations in Frankfort and Ludington. It will continue to guard mariners long into the 21st century.